It is of great use to convert PowerPoint 2007 to DVD. You can share the presentation without MS PowerPoint installed or even a computer. It helps you in various fields like advertising, training, teaching, etc. There are some websites which help you realize the conversion from PowerPoint 2007 to DVD. Though they cannot burn PowerPoint 2007 to DVD directly, they can convert PowerPoint to video first and then you only need to burn the video to DVD easily with some DVD burner. Please read further to know details about the typical representatives: authorstream.com and zamzar.com. www.authorstream.com is a PowerPoint sharing platform which supports you to upload your presentations online for free, and share them with your friends, students or co-workers across the globe. It offers multiple unique features. An important one is the PowerPoint 2007 to video feature. Upload your PowerPoint 2007 presentation to authorstream.com, and choose “convert to video”, after the conversion, you can download the converted PowerPoint 2007 video through the link sent to your email. The animations in your presentation can be reserved. 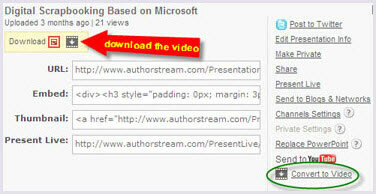 You can simply download your presentation as a video file in the format of your choice - mp4, wmv, etc. P.S. The conversion process can be not that fluent, and you may have to take some time to download the video to your local computer. Besides, free account just allows you to upload the 1GB files at most and the maximum of 10 files. www.zamzar.com is a good web application to convert PowerPoint 2007 to video. It allows you to do the conversion job without downloading a software tool. You can type in a URL of an online PowerPoint presentation or upload file from your computer; then the Web application converts PowerPoint 2007 file(s) to specified 16 video formats including avi, flv, mp4, wmv, etc. Input your email address to receive a message with a URL where you can download the converted file. However, it has the limitation on the file size and file quantity. Free users have a maximum file upload limit of 100 MB (for those with Zamzar account this limit is up to 1 GB) and 5 different files. Because this service is provided through a Web browser interface, it can work on those browsers which run on Mac and Linux. After converting PowerPoint 2007 to video, you can burn the presentation to DVD through DVD burners like Nero DVD burner, Mini DVD burner, etc. The online PowerPoint 2007 converters and free DVD burners enable you to convert PPT 2007 to DVD without any fee. The only thing is that there are various limitations on those Websites. If you want to convert PPT 2007 to DVD under your full control and with better conversion results, you can use PowerPoint 2007 to DVD converter like Wondershare PPT2DVD. This is the easiest and most direct way to do the conversion from PowerPoint 2007 presentation to DVD.